1) A sit-down dinner in the Art Centre's Helen Martin Studio with artists and scientists. 2) A film screening of CATCH. CATCH is a fictional short film about a father and daughter quarantined in their home in a post-antibiotic world. CATCH writer Paul Cooke and director Domic Rees-Roberts, will be available for a Q&A session after the screening. - Entry into this Competition is dependent on acceptance of and agreement to the specific rules of entry in full, as set out in these Terms and Conditions. - By entering the Competition, you are confirming acceptance of these Terms and Conditions. - Entrants must live in the UK and be aged between 16-25. 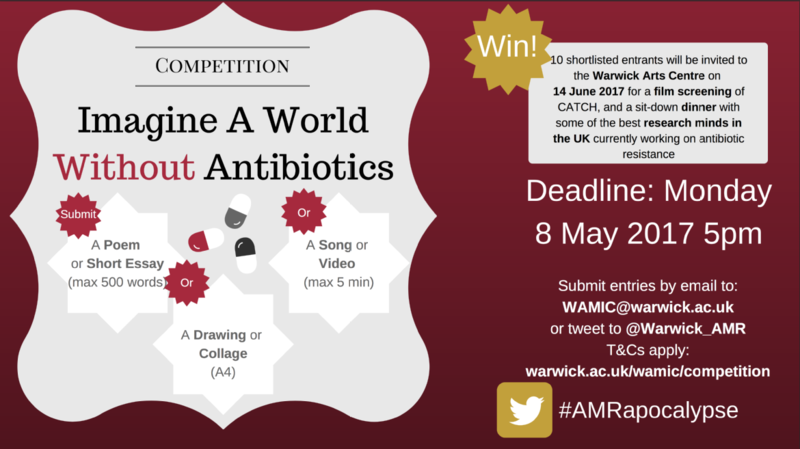 - The art submission can be in any stated format (poem, essay, drawing, collage, song or video) and should relate to the topic "A World without Antibiotics"
- Multiple entries may be submitted; however, no entrant may win more than one (1) prize. - Submitted information will not be used for any other purpose than the competition; it will be stored securely and will not be shared with third parties. - A panel of judges from the University of Warwick, at its sole discretion, (the “Panel”) will select the winning entries based on the criteria set out in these Terms and Conditions. - The winners will be notified via the account or email address by which they entered. Prizes are strictly non-exchangeable, non-transferable (including to any other individual/s), and not redeemable for cash or other prizes (in whole or in part).